It is astonishing how time flies! I cannot believe it is one year already since I had started “This Blogging Thing,” an unlikely name for a blog. Yes, my friends, today, September 7, 2012 is exactly one year since This Blogging Thing, and I came together, and we are extremely proud of the union. Things were rough in the beginning. There was a time when we were not sure whether we belonged. However, as the year progressed, we grew closer and closer. Today we are inseparable. Still, none of this would have been possible without WordPress who has given us the platform and most of all, my beloved blogging buddies, who have embraced and invited us on their computer screens. To all, I would like to say thanks for your support. Your kinds words and encouragement have been tremendously inspiring. For that, I am extraordinarily grateful. I look forward to your continued support over the next months, and years to come. The Declaration of Independence was a statement adopted by the Continental Congress on July 4, 1776, which announced that the thirteen American colonies, then at war with Great Britain, regarded themselves as independent states, and no longer a part of the British Empire. John Adams put forth a resolution earlier in the year which made a formal declaration inevitable. A committee was assembled to draft the formal declaration, to be ready when congress voted on independence. Adams persuaded the committee to select Thomas Jefferson to compose the original draft of the document, which congress would edit to produce the final version. 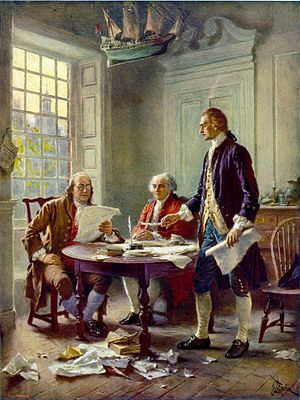 The Declaration was ultimately a formal explanation of why Congress had voted on July 2 to declare independence from Great Britain, more than a year after the outbreak of the American Revolutionary War. The Independence Day of the United States of America is celebrated on July 4, the day Congress approved the wording of the Declaration. We hold these truths to be self-evident, that all men are created equal, that they are endowed by their Creator with certain unalienable Rights, that among these are Life, Liberty and the pursuit of Happiness. — That to secure these rights, Governments are instituted among Men, deriving their just powers from the consent of the governed, — That whenever any Form of Government becomes destructive of these ends, it is the Right of the People to alter or to abolish it, and to institute new Government, laying its foundation on such principles and organizing its powers in such form, as to them shall seem most likely to effect their Safety and Happiness. Prudence, indeed, will dictate that Governments long established should not be changed for light and transient causes; and accordingly all experience hath shown, that mankind are more disposed to suffer, while evils are sufferable, than to right themselves by abolishing the forms to which they are accustomed. But when a long train of abuses and usurpations, pursuing invariably the same Object evinces a design to reduce them under absolute Despotism, it is their right, it is their duty, to throw off such Government, and to provide new Guards for their future security.